Watermelon tourmaline (or bi-colour tourmaline) is a stunning multicoloured gemstone, resembling the juicy fruit we all love! This natural and unique colouring makes this gemstone a popular choice among jewellers. Find out everything you need to know this unique gemstone and how you can use it to create interesting and vibrant handmade jewellery. 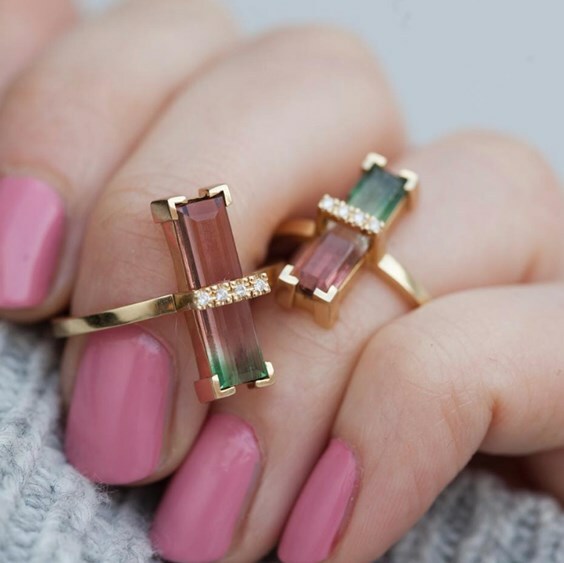 Colour: Watermelon tourmaline has the colouring of pink/red and green, usually separated by a white streak. It gets its name as it resembles the pink flesh and green rind of a watermelon. Appearance: Watermelon tourmaline is a transparent gemstone, which is usually cut as thin polished slices to display their unique colouring. They are also available as cabochons and faceted stones. Formation: Watermelon tourmaline is found within veins of rock from molten magma from volcanoes. When the magma cools, it forms cracks which fill with water and minerals such as iron, lithium or manganese which then forms crystals. Rarity: A range of tourmaline are considered rare and desirable, such as watermelon tourmaline in strong colours and the neon blue form of tourmaline known as Paraiba tourmaline. Moh's Scale Hardness: 7-7.5, making it a tough stone perfect for creating jewellery with. 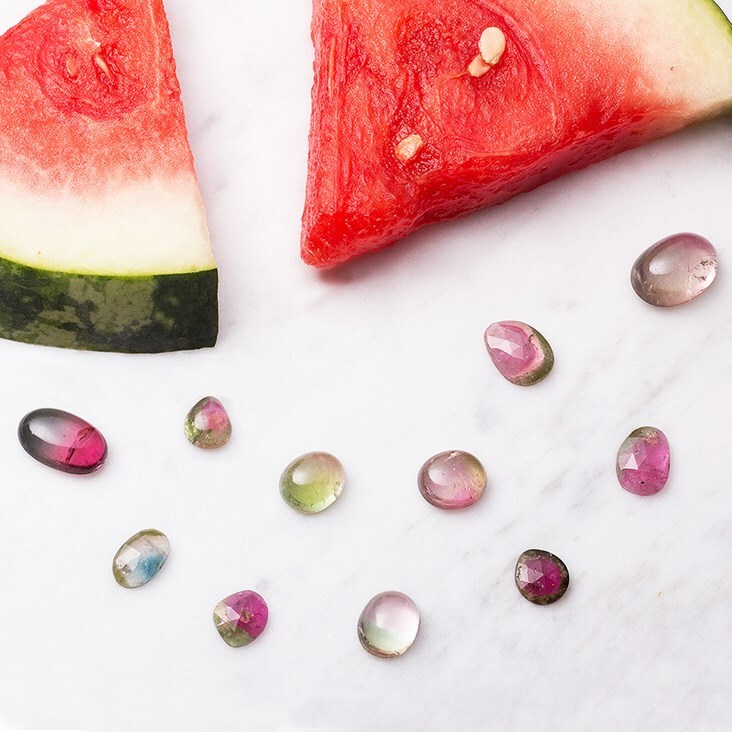 Sourced: Watermelon tourmaline can be sourced from South Africa, East Africa, Brazil, Magagascar, USA and other locations. 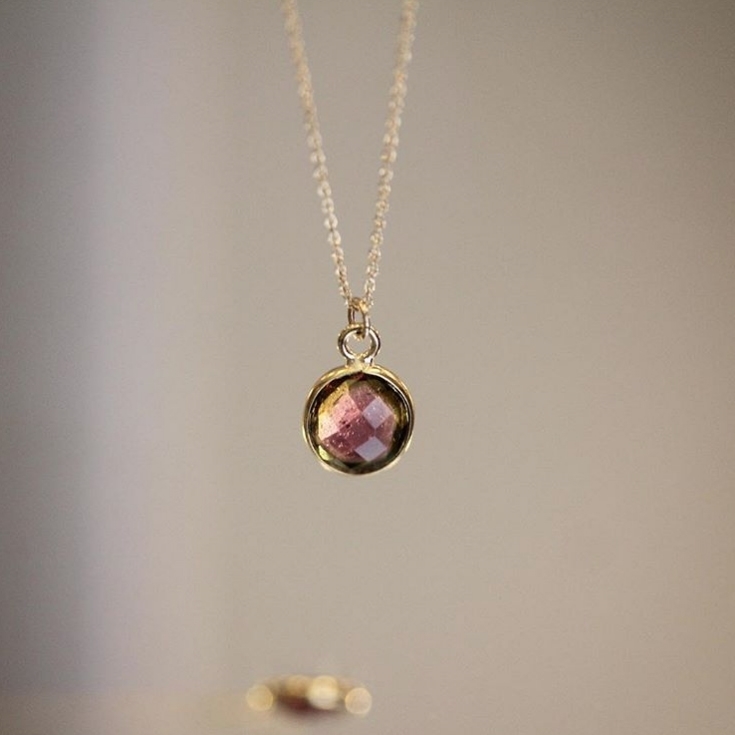 Healing properties: Watermelon tourmaline is believed to be linked to the heart chakra. 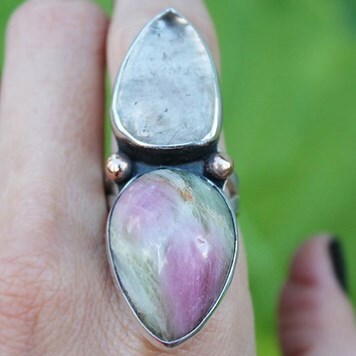 This healing and emotional stone is said to help you find joy, reduce fear and fosters love, tenderness and friendship. 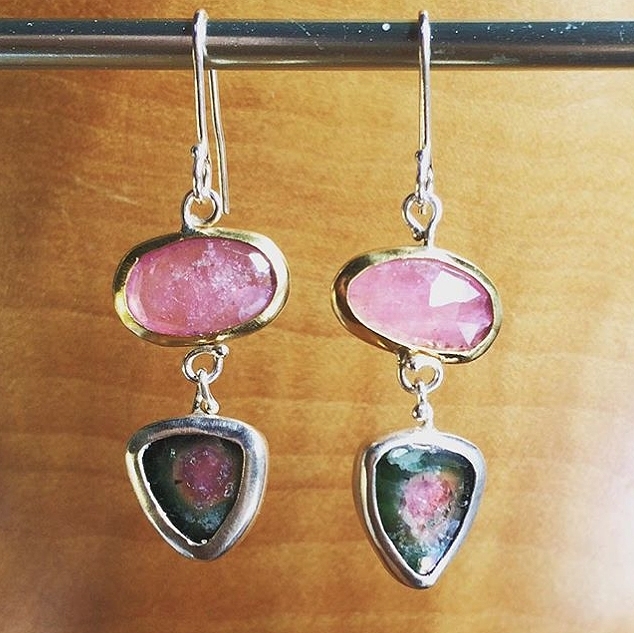 Katie Carder Jewellery has designed these jaw-droppingly juicy watermelon tourmaline earrings, bezel set in 14k yellow gold. Capucinne Jewelry - "Oh these tourmalines. 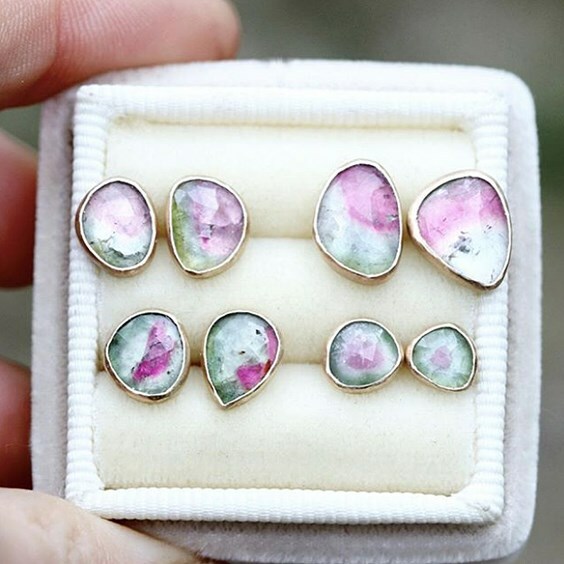 The only gemstone that makes us crave for summer asap!" A beautiful faceted watermelon tourmaline stone set into a pendant, by norbu_bijoux. 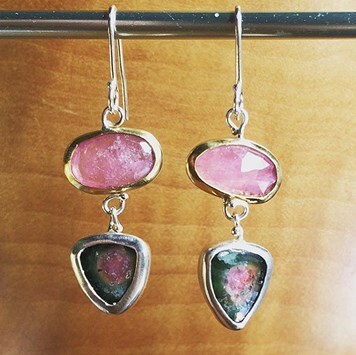 ledajewelco - "Rose cut pink sapphire earrings with watermelon tourmaline drops. Balance your heart and mind and heal your own fine self!" Gather Jewelry - "Fresh off the bench. The bottom stone is a truly special antique piece of pastel watermelon tourmaline that I’ve been hoarding for a couple of years now. Paired with a pretty piece of rutilated quartz, and accent the combo with warm brass detail."